When I first saw Le Patin Libre at Alexandra Palace in Dance Umbrella’s 2014 festival I arrived late and saw only the latter part of their first half, Influences. The second half was Vertical which is the work Dance Umbrella has brought back to London for a limited run on the skating rink in its front yard at Somerset House. Renegade skaters, cutting edge ice dance performance runs the publicity with a smile. Watch the award-winning Le Patin Libre (they won the Total Theatre & The Place Award for Dance at the Edinburgh Festival Fringe 2015) carve the ice, with their signature blend of technical skill and cutting edge style (at the Quebec Delegation reception Emma Gladstone added that the group had also a strain of bloody-mindedness for forging ahead with their project despite criticism and jeering from hockey players and ice dancers at home in Montreal). Their mix of intricate footwork, wit, speed and grace pushes the boundaries of what is physically possible and carries ice-skating performance into the 21st century. There’s certainly some disambiguation to be done to separate the skating of Le Patin Libre from other forms of dancing on ice. Translating the company name — free skating — is true to its origins but doesn’t do justice to the artistic endeavor of the group and ‘artistic free skating’ sounds like an Olympic category. So until some apt description can be found the only way to know what it is they do is to see them perform. They have some work to do as well; while all five (Alexandre Hamel, Taylor Dilley, Jasmin Boivin, Pascale Jodoin and Samory Ba) dress casually (no glitter to be seen) and take care to present their work without the trappings of figure skating, they are not averse to feats of skating virtuosity, as if to reassure us they are former professional skaters. They don’t need to. The articulated solo by Ba, Jodoin’s sensuous spirals and the long, sweeping, swooping, interweaving patterns of the quintet up and down the ice are what mark the originality of Le Patin Libre: understated artistry that could not be achieved without their level of skill. 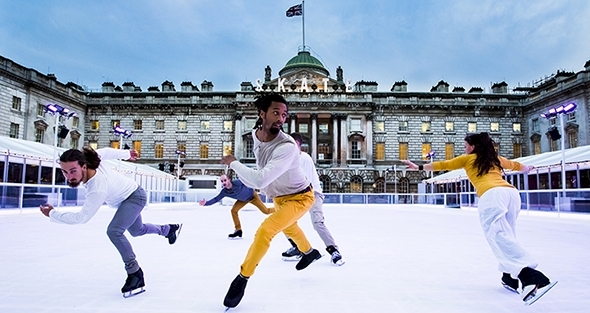 It’s not just the ice but the space that Le Patin Libre transforms with their art. Seeing what they did at Alexandra Palace was a revelation of sheer volume; at Somerset House the space is, paradoxically for an open-air rink, constrained, perhaps by the monumentality of Sir William Chambers‘ neoclassical architecture with its ice-sugary lighting in shades of blue and pink. By comparison with the performance at Alexandra Palace, Vertical at Somerset House seems more of a sampler, welcome nonetheless and well worth seeing, but not fully representative of what this quintet can do. Their ideas need the freedom and distance of the largest indoor rinks because their lines and speed and dynamics — like a flock of long-legged birds in formation — can best be appreciated on that scale. 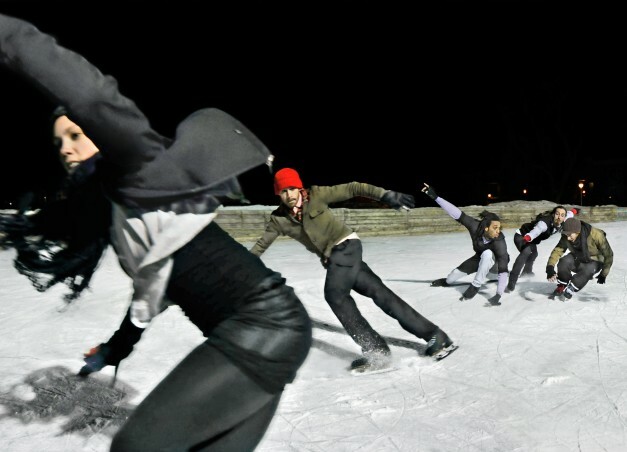 Although the development of the group originated on outdoor rinks in Montreal, the performers feel more at home navigating at high speed the vast indoor spaces of skating rinks where the theatrical effects (here by Lucy Carter) of lighting and haze, moreover, are not subject to the vagaries of outdoor weather. Inserted like an unofficial preview into the opening of Vertical (as Alexandre Hamel told me after the performance) are some ideas the company is developing for a new show which hint at a form of minimalism, enhancing the geometry of patterns with the glistening lines of the skaters’ trajectories to expand our sense of space and time. While Vertical and Influences have gone a long way towards creating a new spatial dynamic of dance, this new work has the opportunity to consolidate the form. Perhaps by then it will have a name. There are eight more performances of Vertical at Somerset House on Friday January 14 at 18h30 and 20h00 and on Saturday and Sunday January 15 & 16 at 18h30, 20h00 and 21h30. 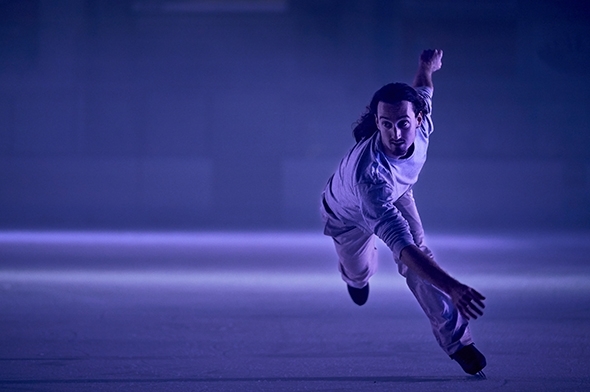 Théâtre de la Ville will be presenting Le Patin Libre in Vertical Influences at the Patinoire de Bercy in Paris from 14 to 17 June. Two hours drive from Teddington should get you well out of London but on this particular Thursday it only got me to Alexandra Palace 15 minutes after the performance of Le Patin Libre started but as some kind soul who was wheeling his fold-up bike on his way to see the Hugging Guru in another part of Alexandra Palace told me, the time you arrive is precisely the time you should arrive. Notwithstanding the wisdom of his statement, I would have liked to see the beginning of Le Patin Libre’s Vertical Influences because what I saw subsequently was such a revelation. Here you are on the ringside of this vast arena watching six skaters tracing lines in the ice like exuberant explorers, pushing space in front of them and pulling it behind them like a flock of birds. There is still a sense of the proscenium theatre because we are seated in a cosy rectangle on one side of the rink and the performers play towards us. But otherwise the dynamics of the conventional theatre are blown away by the sheer volume of this space, and also by the dance form. The origins of Le Patin Libre began on the frozen lakes and outdoor rinks of Montreal where ice underlies the national temperament. Every local park in winter has its seasonally constructed ice rink dedicated for the most part to hockey but also to free skating (patin libre). The photograph on the front of Dance Umbrella’s printed program gives you the idea. All but one of the members of Le Patin Libre took to the ice as naturally as we might learn to dribble a ball in the back yard. They then developed their skills in figure-skating competition but found the creative side limited. Alexandre Hamel got together a small group to develop a choreographic form on ice, and the rest, as they say, is icestory. Back to Alexandra Palace where the skaters are like free spirits in autumn colours (courtesy of Jenn Pocobene) stamping out rhythms on the ice and swooping around the rink chasing each other, Hamel in an orange shirt darting in an out of the group. I am reminded of Paul Klee’s description of his doodle sketches as ‘taking his pencil for a walk’. Taylor Dilley doodles on one leg for long, slow stretches, but for the most part the skaters take their entire shape around the ice at high speed, skating with ballet bravura without having to compete for points. All six skaters have characters that brim with confidence without ever getting haughty about their skills or precious about their choreography; they have removed themselves from the trappings of figure skating and simply dance on ice, drawing the audience into their performance with endearing modesty. Perhaps it’s because I lived in Montreal for so long that the performance touches me deeply, but I felt at Alexandra Palace that I was not alone. By taking the sport and artistic competition out of skating, Le Patin Libre presents a new dynamic of dance, one that allows shapes to glide and swoop and turn at dizzying speeds. And because the performers need so much space to move, the dance venue has expanded to heroic stature. Alexandra Palace is not exactly beautiful but tracking these dancers as they course around its rink is exhilarating. It is as if our senses grow into the new volume, enlarging our perceptions and expectations. Perhaps this is what Edward Gordon Craig had in mind when he wrote about his vision of theatre having heroic stature. There is much to explore in this new form and it is an inspired co-commission by Dance Umbrella. After the interval, the ‘front’ has changed from the side to one end of the rink where we are seated on benches on a covered section of the ice. The skaters enter from the furthest point from the audience gliding endlessly towards us in Lucy Carter’s brilliant backlight until they turn effortlessly at the very last, impossible moment to regroup in the distance. In between these long patterns that resemble cloverleaf motorway intersections, the skaters introduce their individual skills in a narrow band of light across the front of the ice. Coming forward again, they stop suddenly in the silence of snow. Jasmin Boivin, doubling as the composer for the group, smiles a wicked smile in front while the others weave down the ice in S-curves and in beautiful counterpoint Boivin skates up the ice as the others race down towards him, splitting around him like water round a pebble. There are quartets, a lovely turning solo by Pascale Jodoin and a superbly articulated riff by Samory Ba with his elongated body in shirt and orange pants that has the syncopated, ice-tapping rhythms of free improvisation. The others join for more gliding patterns at speed, their camaraderie as palpable as their joy of movement. Driving home was a breeze.